New York Institute of Dance & Education Teacher Certification puts an easy to understand outline of Syllabus Exercises in your hands! 1) Learn the 4 Foundational Level 1 Exercises. 2) Be Awarded Level 1 Authorized Instructors Status. Authorized Instructor Status will allow you to teach while developing a deeper understanding and application of how to share RMF. RMF Authorization allows you to teach and earn revenue immediately. Teaching immediately is a crucial element in your development and a central part of your preparing for final Level 1 Certification. You will receive RMF Level 1 Authorization that will allow you authorization to begin to teach RMF level 1. Certification will come after verification of skill proficiency after having practiced teaching what has been learned. Certification evaluation does not have to happen in person however, certification can happen by remote verification or recorded examples of qualified skills in a video clip that meets the acquired proficiency required and signed off by NYIDE. This process will make further support and learning very easy for the interested parties. 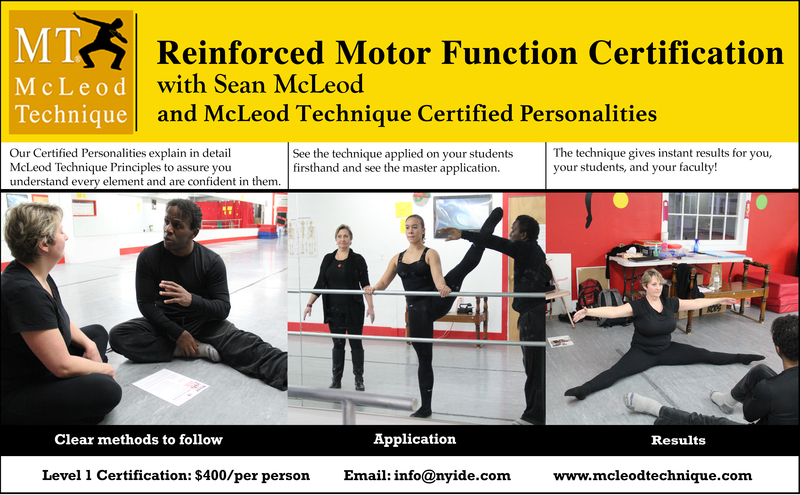 Secure your spot in the McLeod Technique Reinforced Motor Function Clinical.